First, before I get into the contest, I wanted to say that I’m working on answering the questions for the Ask Me Anything at Wattpad. I have some answers posted now, and I hope to get them all answered by tonight. There were a lot of great questions, and you can check out my answers: here. One of the most exciting/terrifying parts about releasing a book into the wild, the way Ice Kissed will be tomorrow, is knowing that readers will have the book in their hands, reading it. My part with the book is done, and the book has to make it’s way in the world on it’s own now. One thing that makes it a little less terrifying (and is just a lot of fun) is seeing readers with the books. So far Ice Kissed, I thought I would ask for pictures of your copy of Ice Kissed with you, your best friend, your sister, your pet – whoever wants to pose. I personally hate posing for pictures, and I suckered my dog Isley into it, so that’s why I thought I’d extend it beyond a selfie. 1. 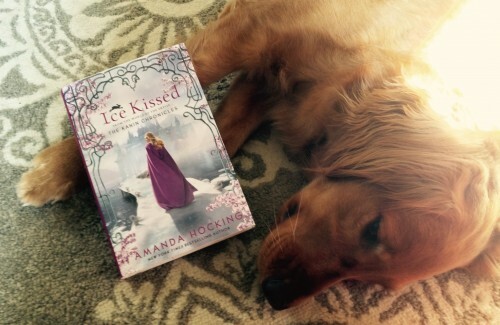 Send a picture of you (or your BFF, sibling, cousin pet, etc) with a copy of Ice Kissed (paperback, hardcover, audio, ebook, library book – all count as long as the cover of the book is somehow in the picture) to hockingbooks@hotmail.com. Be sure to put “Ice Kissed in the Wild” in the subject line. 2. To earn additional entries, post the picture on Instagram, Twitter, Tumblr, and/or Facebook. Tag me in the picture when possible with the hashtag #IceKissed. Be sure to include your username(s) and where you shared it in your email so I can put the bonus entry to your name. You can earn up to four bonus entries if you post on all four social media sites, but you do not have to post on all four if you don’t want to or don’t have an account. 3. Although you can enter multiple times, only one prize will be awarded per person. 4.This contest runs from today (May 4, 2015) until May 13, 2015. Emails must be sent by 12:01 am on May 14, 2015. Winners will be chosen at random and contacted by May 17, 2015. WooHoo! Got a new blog! !